Honey Bootique: Stamping Bella Art Journal page- Mostly Naomi! Stamping Bella Art Journal page- Mostly Naomi! Today I have a little something different to share with you. For a very long time now, I've been wanting to do some art journalling/mixed media but didn't really know where to start or what to do. I watched some YouTube videos for ideas and supply lists and it still took me ages to get going. Isn't it funny how hard it is to get started with something that's completely new to you? I used a vintage book and glued several pages together and then stuck down some sheet music and other book pages with masking tape and then covered the page with white gesso. I then sprayed the page with Lindy's sprays (see below for colours) and then splattered with the black spray and a Tim Holtz White Picket Fence distress spray. I then stamped the background using Stamping Bella's Java Spills which I coloured with gelato and smudged with my finger. I also stamped the main butterfly from Stampington's Time and the mini butterflies and flower from Hero Art's Friend. I stamped Stamping Bella's Danielle Donaldson's Mostly Naomi on copic paper and coloured with copics. I cut out and glued to the page and then outlined with a hard pencil. I then stamped Visible Image's "vision" from their Where Dreams Take You set over the top of her legs. I then added some white gel pen highlights and some Tim Holtz word stickers which I also outlined with heavy pencil. And that's it!! 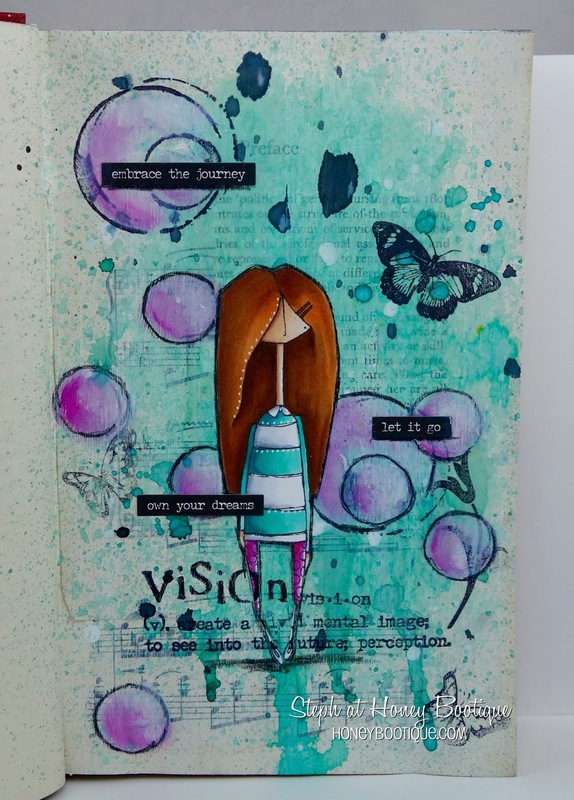 One thing I must do is give a shout out to Marta from Maremi Small Art- she has amazing videos on everything to do with art journalling and mixed media- from supplies to tutorials. She's so amazing and has been my influence in starting out. Here's a close up of Naomi. I have to say I have really enjoyed starting art journalling and I've already done some more pages. So expect to see some more of these as well as my usual cards.